1969 Mercury Cougar: Kelowna Daily Courier - Was the Mercury Cougar a better Mustang? At posted from the Kelowna- Daily Courier -Friday November 8th 2008 -Was the Cougar a better Mustang? 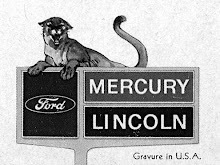 Pity the poor Mercury-Lincoln dealers back in the mid-1960s. Flush with acres of Continentals, Park Lanes and Montclairs, not to mention a few assorted econobox Comets, these folks could only stare in hopeless exasperation as eager prospects flocked down the road to the nearest Ford store. The new Mustangs had arrived. The birth of Lee Iacocca’s baby had resulted in a severe case of mass automotive hysteria and ushered in an era of pony-car madness. Suddenly, every North American manufacturer was chomping at the bit to cash in on this latest car craze. But Ford’s long-suffering Mercury retailers would have to wait nearly two-and-a-half years after the Mustang’s ground-breaking introduction before they could add some sporty car spice to their meat-and-potatoes lineup. 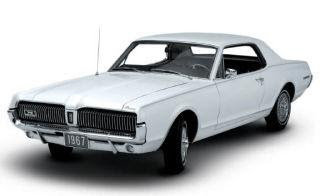 When the Mercury Cougar finally arrived in the fall of 1966, it was one of several fresh entries into the pony-car race, including the Chevrolet Camaro, Pontiac Firebird and Plymouth’s clean-sheet second-generation Barracuda. Mercury took a decidedly different approach with the Cougar. Early advertising touted its luxury car leanings with the tag line, “The Fine Car Touch inspired by the Continental.” Also promoted was the Cougar’s comfortable ride and equally plush bucket seats. The new “Cat” was built using a Mustang chassis, but its wheelbase had been increased by about seven centimetres. The extra distance created a far more hospitable environment for rear-seat passengers and added to the car’s passenger-friendly ride. Visually, the Cougar was a pleasant piece. Along with its must-have long-hood, short-deck styling, the car featured unique hidden headlights that remained cloistered behind the front grille until pressed into service. But the real knockout feature was the car’s sequential rear signal lights that strobed in the appropriate direction whenever the stalk indicator was flicked. Unlike the Mustang, the Cougar was available only with V8 power. The base engine was a 200-horse, 289-cubic-inch unit, while a 225-horsepower, four-barrel-carb version was available as an option. If this wasn’t enough, the optional GT package featured a more muscular 390 cubic-inch V8 stuffed between the Cougar’s shock towers. Midway into the 1967 model year, Mercury introduced the Cougar XR-7, complete with full gauges, woodgrain interior trim, leather seats and other fancy bits. First-year sales of more than 150,000 Cougars proved the public was hungry for a ponycar with a little more flair and substance than the rest of the field. For 1968, the Cougar received the new 302 cubic-inch V8, as well as the horsepower-abundant 428 and racing-oriented 427 cubic-inch V8 options that cranked out 335 and 390 horsepower, respectively. That year also saw the creation of one of the rarest of Cougar models, the XR7-G. The “G” stood for racing legend Dan Gurney. This model included a special fibreglass hood complete with scoop (non functional, though) and racing-style locking pins, fog lamps, special alloy wheels and interior trim. Only 619 XR7-Gs were shipped from the factory and, of those, slightly fewer than 200 went to Hertz to be used as rental units. In 1969, the mildly restyled Cougar family grew to include both a base and XR-7 convertible. You could still order the big-block 428 motor, but the raunchier 427 was trimmed from the order sheet. A new 351 cubic-inch-engine series became available that year, with output ranging from 250-300 horsepower. The hot setup that year became the Eliminator, with its wilder colours, look-at-me decals and striping plus a rear-deck spoiler. All of these items might have worked on any other pony car, but the Eliminator package only served to make the sleek, sophisticated Cougar look decidedly undignified.The Cougar remain basically unchanged through 1970, although the 390 V8 had finally disappeared from sight. Sales, however, dropped as pony-car buyers shifted to more high-performance offerings that were being heavily marketed by the competition. 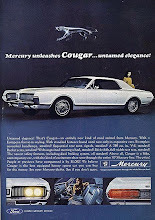 This seemed to be the signal for Mercury’s product planners to turn the Cougar into a true boulevard cruiser. Although the 1971 version continued to used the Mustang’s platform, the car became significantly bigger, stouter and pricier, with more luxury touches included as part of its standard features. But for four solid years, the Cougar represented a softer, more eloquent interpretation of the pony-car revolution and gave its proud owners a taste of how future “personal luxury” cars would evolve. These days, the Cougar is rapidly gaining in popularity among collectors who consider its unique and tasteful styling and plenty of on-tap power to be a cut above the Mustangs, Challengers and Camaros of that era. It’s funny, but those are the exact same reasons the original Cougar became such a sales success in the first place. Malcolm Gunn is a feature writer with Wheelbase Communications. He can be reached at wheelbase.ws/mailbag.html. Wheelbase Communications supplies automotive news and features to newspapers and websites across North America.